Some time ago I noticed a clicking noise somewhere in headset area. Noise appears under pressure, also it clicks when I tightening the headset. First thought was that problem is with headset bearings, because steering was like "indexed" in center. So first what I did - replaced bearings and greased everything. Indexed steering had gone. But clicking noise remained. 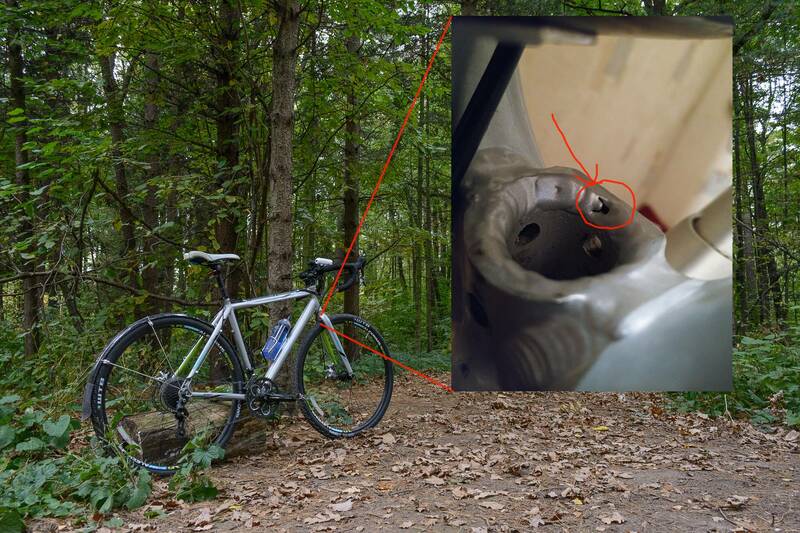 Yesterday I removed mudguard to check fork for the cracks and found this small hole where fork meets steerer tube. Can it be source for clicking noise? Is it dangerous to ride with it? That's just a poor weld. Notice there are other deliberately drilled holes in that area so an extra one is not a problem. Clicking in the headset area is much more likely to be flex between the steerer and stem, stem and bars, or possibly the headset races pressed into the frame. If the click happens as you go over a bump or change force on the bars through pedal strokes that would point to those interfaces as a culprit. Not the answer you're looking for? Browse other questions tagged fork headset noise clicking or ask your own question. Will this fork crown race installation tool work? Gap between lower headset cup and fork. Is this likely to be a problem? What is the ideal travel for dual crown fork? Dual crown fork or not? Frequent fork swapping, best practice?